We love autumn here at ever after, especially when it comes to styling a wedding. There’s so much you can do with rich autumnal colours and decor items (such as miniature pumpkins!). 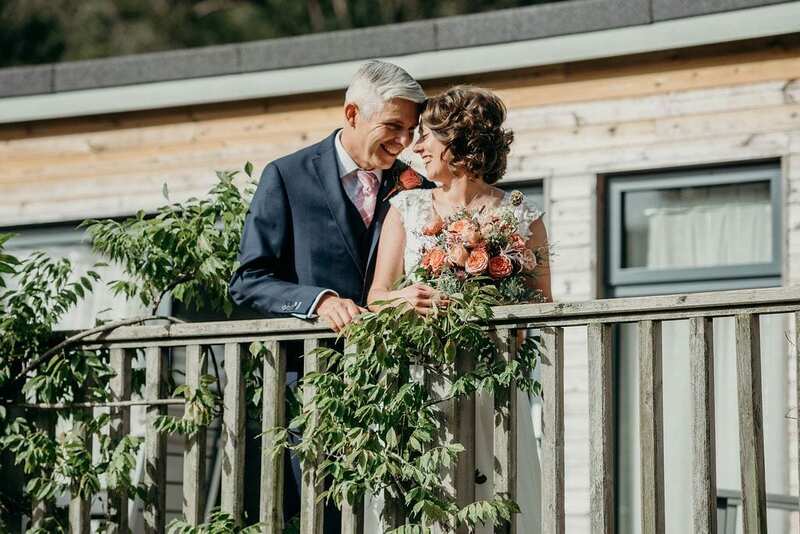 During the 3rd week of october we were feeling super autumnal for clare & simon’s wedding, and working from the couple’s preferences and inspiration from the flowers, we created a cosy wedding for two (albeit amongst the uk’s bout of hurricane ophelia!). I love our intimate weddings at the best of times, but they are particularly fabulous for styling as we can work with our full range of elopement bits and bobs (glasses, charger plates, vases, crockery, cutlery, etc). For clare and simon, we had a good idea of the kind of style they were going for from clare’s pinterest board and ideas she had given us, but we waited to see the flowers before making a final decision. We went for a taupe table cloth with grey napkins, deep orange charger plates, taupe dinner crockery, and our uber-cute reindeer side plates. We finished the ‘look’ off with orange glasses, black & gold cutlery, our cream upholstered chairs, and put clare’s bouquet in a bark vase to sit as their centrepiece. And not forgetting the miniature pumpkins! Ambiance is important for any wedding, but particularly small ones, so the presence of candles was essential. Hurricane ophelia gave her best shot at trying to blow them out every 10-minutes, but she quietened down in the afternoon and the re-lit (and re-lit again) candles remained safe for the duration of clare & simon’s evening here together. The day before clare & simon’s wedding, Nicola had had an autumn styling day and created a brilliant pumpkin and fungi-log display above the wedding barn (which is also the first place you walk past upon arrival). Previous Post2020 wedding dates open for booking in 6 days...!